Located in the southeastern corner of the Mediterranean Sea between Israel and Egypt, Gaza is an ancient city with an unfortunate recent history of war and occupation. At present Gaza is governed by the Hamas movement and has the status, de facto, of an autonomous but besieged city-state. The city has no natural harbor and no commercial harbor, but it has a small fishing harbor enclosed by breakwaters. There are no internationally-recognized aids to navigation. Date unknown. Active; focal plane about 17 m (56 ft); continuous white light. Approx. 13 m (43 ft) round tower with lantern. Ali Hejazi has a 2016 photo, Yasser Hamad has a photo, and Google has a distant satellite view. Located on the beachfront about 2 km (1.25 mi) southwest of the fishing harbor. Site open, tower closed. 2016. Active; focal plane about 16 m (52 ft); continuous white light (?). 14 m (45 ft) round tower with lantern; the tower is covered with multi-colored zinc and tin plates. Dr. Basem Naim's photo is at right, and Google has an indistinct satellite view. 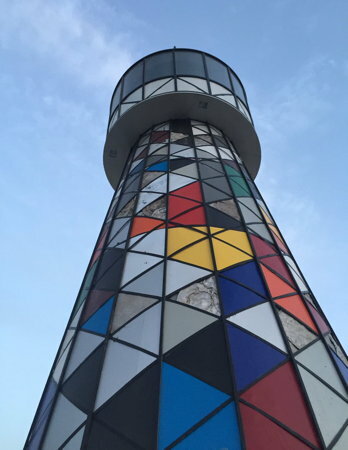 This lighthouse was designed by the artist Sharif Sarhan and built using materials recycled from buildings destroyed in the fighting with Isreali forces in 2014. The construction was funded by the A.M. Qattan Foundation and the Danish Center for Culture and Development. Located on the waterfront at Gaza's harbor. Site open, tower closed. Date unknown. Demolished (we don't know if this beacon was ever lit.) Approx. 15 m (49 ft) round conical tower on a round cylindrical base, topped by a tall mast. Lightphotos.net has a December 2013 photo by Mahmud Hams, and Google has an indistinct satellite view. However, the light is not seen in a December 2015 street view by Hussam El-Madhoun. Formerly located on the north breakwater of Gaza's harbor. Site open. Posted June 20, 2016. Lighthouses: 2. Checked and revised March 6, 2019. Site copyright 2019 Russ Rowlett and the University of North Carolina at Chapel Hill.